You can become a permanent part of Kettunen Center or the Michigan 4-H Children’s Gardens by sponsoring a brick! For a $250 donation (which can be given in a lump sum or over five years), the name of your choice will be inscribed on a commemorative brick. 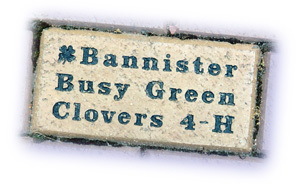 The bricks are 4×8 inches and allow for three lines of inscription with 15 characters per line. For an additional $25 ($275 total) you may order a paper weight-sized mini brick (1½x3″ dimensions), an exact replica of the brick paver. An 8×8-inch brick is available for a $1,000 donation. Bricks can be donated in your name; in honor of a family, friend or club; or in memory of loved ones. They are then placed within a beautiful courtyard, either the Demonstration Plaza in the Michigan 4-H Children’s Garden (at Michigan State University), or at Kettunen Center’s Red Oak Plaza, Trillium Courtyard or the Chrysalis Courtyard (Tustin, MI). Bricks are usually installed in the spring and fall of each year. Print a brick sponsor form to mail in with your payment to sponsor a brick at the Michigan 4-H Children’s Gardens or Kettunen Center.